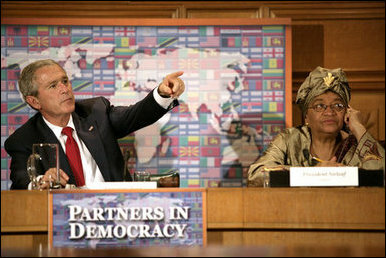 Bush’s Africa policy has three pillars which mostly are comprised of holding lots of meeting with various groups and on different issues affecting African countries (ie: AU, malaria, HIV/ AIDS, growth and opportunity act, etc.) Meetings a indispensible when one does not want to act. I am afraid the US’s policy on Africa is just a bunch of words, no action. Another great site that I found helpful in my search of US’s African policy was Africa Action. Each year they write a full report on the US policy for Africa. They critique and offer potentials and what needs to happen in years to come. Africa Action opens the report with this quote, “2006 will help clarify whether the compassionate concern for the African continent, worn like a badge by western leaders last year, is a true determinant of Africa policy, or whether it merely masked other, more ‘strategic’ and less ‘benevolent’ impulses and interests.” 2005 was a great year for more focus and interest in African issues. It was a year of more advocacy and awareness about Africa and thus there was more talk of doing something on the continent. I find this is a beautiful quote to begin critiquing the US African policy. What has 2006 shown? It seems that US policy is focused only on strategic advancement and leans no where to the benevolent side. Africa Action begins by outlining the year from Live 8 to Live X. Concerts which raised funds and awareness for Africa to US military sweeping into the continent to be sure America is secure. This comes with the development of the Africa Command as well. This military shift in Bush’s Africa policy obviously speaks to the ‘War on Terror’ focused on intelligence gathering and keeping al-Qaeda out of Africa. Yet even with this upswing of troops and US intelligence in Africa a genocide continues and conflicts spread, threatening regional security. Another development to note in US policy is the potential of African oil. It is estimated that over $10 billion a year will be invested by the US in African oil activities. Many policy analysts say that the US needs to shift its oil dependence from the Persian Gulf to the Gulf of Guinea, however as many analysts fail to realize, African oil is a creates a great deal of conflict by itself without the US involvement. The US may only intensify conflicts and make themselves a target. Lastly, the Africa Action report notes the slim mention of security in the US Africa policy. With the growing threat to public health and differences on global issues, a great disparity is enlightened between African priorities and American interests. The report also highlights the hypocrisy of the current Administration focused on showing its humanitarian side and not its creeping military and strategic involvements. The US African policy is also not within in the lines of what most Americans would like to see as the US policy towards Africa. The US needs to adapt its policy to involve African leaders and to include the voice of the American people. I encourage you all to read the site on US Africa policy and the Africa Action report. After reading let your politicians know how you feel and what you want to see happening in Africa from the US. Previous Previous post: africa’s long to-do list?